Ok, cool. Also, just curious, did you read Kryuna's bio at all? yes I have, wait... oh no! Yeah, this could get awkward. I think it fits in my case. But you forgot to say one thing: if she came at the family meeting regarding the death of Ginny and if she was on Vladin's and Athena's side. Yes. Perfect. Welcome to the family. Equipment: Money and a lot of it. He carries an expensive sword. It's mainly to show how wealthy he is, but it's still functional. Just not as functional as a normal blade. Appearance: A scarlet red, with a deep ocean blue to accent it. Personality: cocky, brash, and calculating. He's going to do waht he can to accomplish his goal, killing Song. So you officially have more characters than me. You: Geet, Capella, Melody, Symphony, Rye and one more that I forgot his/her name. Me: Vladin, Athena, Ghabix, Mark, Rena. Yes, now I have more characters. It's been itching at me when I had an odd number of them. I made a new character not only because I want to have a Symphony/Sun like character, but because I want to have one that would resonate with Ghabix, as seeing that he is the more generic of the bunch. I think this is the last one that I'll make. Appearance: Tall Okotoan (about the same high as Rena and Mark). He had a dark cloak that blends with the shadows. His armor is black and rusted, had clawed fingers and some pieces of his armor are cracked. His eyes are purple and shiny, and he usually had a leather back with different things in it. Personality: quiet, vicious, merciless, evil, he prefers to work alone. When you talk to him you almost feel the sensation of walking in a graveyard in the nighttime. Bio: Arion is Ghabix's bigger brother. His father's great great great great great father was a shadow Okotoan, and that explains the element. Nobody believed that there will be another shadow Okotoan in the family, seeing how 'diluted' the element was, but here he is. Arion spent more of his childhood as a normal child. He had 24 when Ginny was killed. His parents couldn't believe their eyes when their older son was on Vladin's father side, instead of their side (both of them, together with Ghabix were on Vladin's side). After that night, Arion and his parent's had a huge argue that ended up with Arion leaving them and running away. He was found by a bounty hunter that took him as his sidekick. Arion learned a lot of things and his favorite activity was to kill. At first, he was only killing bad guys, but he ended up killing civilians with no particular reason. This made his teacher angry and he wanted to abandon him, but Arion killed him too and left his whole head as a trophy. He has met once with Ghabix. His younger brother made him to see the light again for a few days, until Ghabix called Narmoto. The Jungle Okotoan discovered how many bad things his brother did, and he got scared, so he asked Narmoto what he should do. The Protector sent a few guards to caught Arion and they did, but Arion killed them all and, yet again, kept their heads. Since then Arion is hating Ghabix and tried to kill him a bug number of times. He is hating everybody and he is always happy when he is expanding his collection of unbodied heads. I am not 100% happy with this backstory, but I think it works for now. Welp, time for me to jump on this shadow-okotan bandwagon! Element: Jungle, Shadow. It's a little complicated, how that happened. Weapons, abilities, and equipment: Sevik carries a shortsword and an elemental crossbow on his person, along with your standard camping supplies. He wears a necklace and two bracelets decorated with elemental Light crystals. Why an okotan even partially-affiliated with Shadow would wear such jewelry is certainly puzzling, but Sevik says he wears them because "they're pretty, and they're better than Lightstones". Sevik's connection to elemental shadow manifests itself in the form of a small selection of powers for him to use. Frequent use of these abilities in a short amount of time can be... unhealthy for Sevik. -Sevik has an increased resistance to Shadow-based attacks, but an increased vulnerability to Light-based attacks. -Night Hunter: Sevik's vision and hearing is more acute at night and dimly-light areas. -Blink: Sevik can transform into a cloud of shadowy fog and reform, at maximum, ten feet away in any direction. This fog is vulnerable to Light-based attacks. Shadow Cloak: Sevik can cause the shadows around him to cling to his form, making him harder to hear and see, but not completely invisible. The glow of his jewelry can ever-so-faintly be seen through the "cloak", and a keen-eyed okotan could make out Sevik's silhouette if they looked hard enough. Sevik can also use this ability offensively to temporarily blind and deafen opponents. This ability works best at night and in dimly-lit areas. Bio: Sevik is an easy-going, introverted okotan. He is humble to the point of being self-deprecating, but assures those around him that it's all in jest and puts on a smile to further put their minds at ease. Sevik is silent most of the time, and prefers to stay out of the proverbial spotlight. He's happy to help others, but his reluctance to open up to people and his lack of social skills make it difficult for him to form real friendships. Sevik gained his ties to elemental Shadow from a chance encounter with a semi-sentient entity of said element. 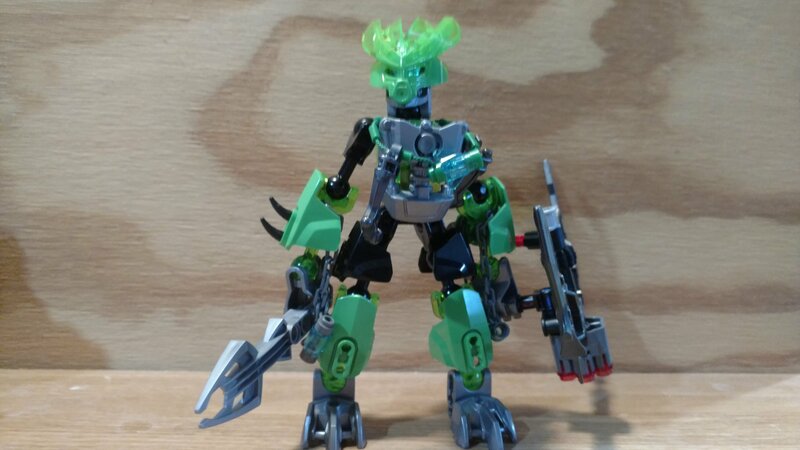 Remember how I said that Stranger was created from the immense amounts of Light used in the Toa's final battle? This entity came into being under the same circumstances; it was a byproduct of all the Shadow being thrown around. Sevik, quite liking being in control of his own body, quickly decked himself out with Light crystals and sought the aid of Light-affiliated beings to ensure that this entity could never overtake him. Over the years, the entity has merged almost completely with Sevik's being, granting him the abilities listed here. Fully aware of the stigma surrounding the element of Shadow and all people, places, and things related to it, Sevik does his best to hide this little chapter of his life from others. Appearance: Black and transparent purple armor with a black Kakama shaped mask about 17 in age. Bio: Hipa is from a Mining village in the Region of Earth. Hipa have worked most of his life in the mines and seen a thing or two most notably the protector of earths daughter(She is not a character that I plan to make but if you want to make that character knock yourself out, she isn't to important too Hipa story that's why I don't need to make her) which is his love interest(something he barely mentions or talks about). Hipa turns 18 in a matter of months and is out searching for a home and hopefully a new job in the Mask maker city.